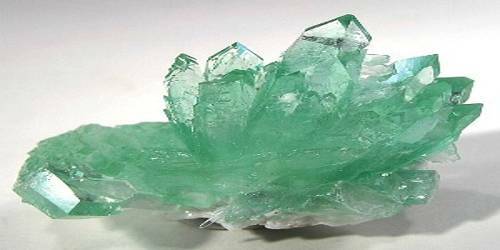 The name apophyllite refers to a specific group of phyllosilicates, a class of minerals. Apophyllite, whose name roughly means “to leaf apart” in Greek, is a mineral classic. 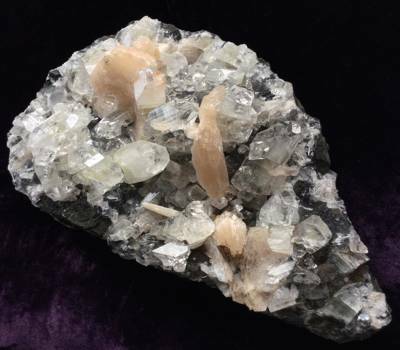 Originally, the group name referred to a specific mineral, but was redefined in 1978 to stand for a class of minerals of similar chemical makeup that comprise a solid solution series, and includes the members fluorapophyllite-(K), fluorapophyllite-(Na), hydroxy apophyllite-(K). Apophyllite can be found in India, the USA, Brazil, Scotland, Northern Ireland, South Africa, and Mexico. There are also deposits found in Canada, Iceland, Norway, Germany, and Japan. Other Characteristics: Prism faces are striated lengthwise, some specimens are fluorescent and crystals will flake when heated. It is probably the first exotic mineral that a young collector will own after filling up on specimens of calcite, quartz, pyrite, galena, mica, fluorite, gypsum, apatite, etc, etc. After these common minerals, apophyllite seems like a real rarity and it offers so much to the collector. It has beauty, pastel colors, a bright luster, interesting well-formed habits, unusual associations with other exotic minerals and recently large amounts of quality specimens have become available at amazingly low prices compared to twenty years ago. Though relatively unfamiliar to the general public, apophyllites are fairly prevalent around the world, with specimens coming from some of the world’s most well-known mineral localities. These localities include Jalgaon, India; the Harz Mountains of Germany, Mont Saint-Hilaire in Canada, and Kongsberg, Norway, with other locations in Scotland, Ireland, Brazil, Japan, and throughout the United States.